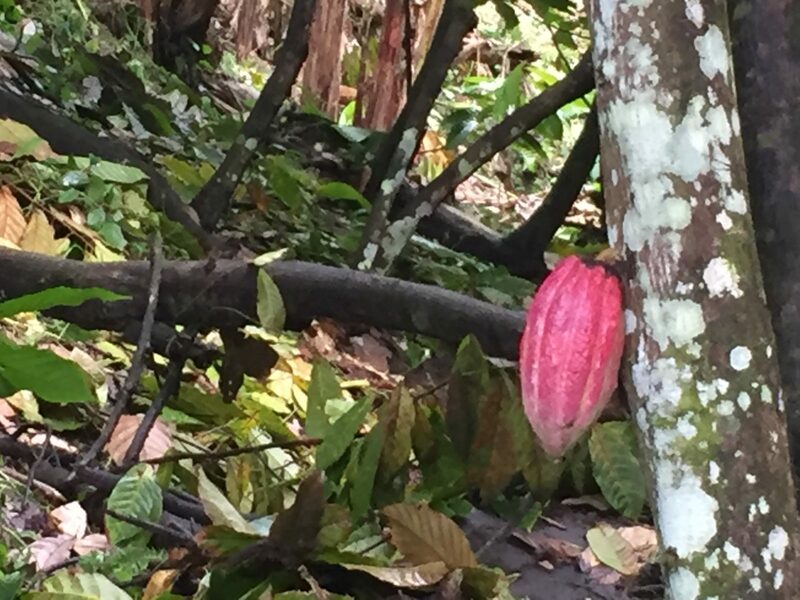 An hour later, we arrived at Crayfish Bay Cocoa Plantation, a 200-year old, 15-acre cacao plantation. 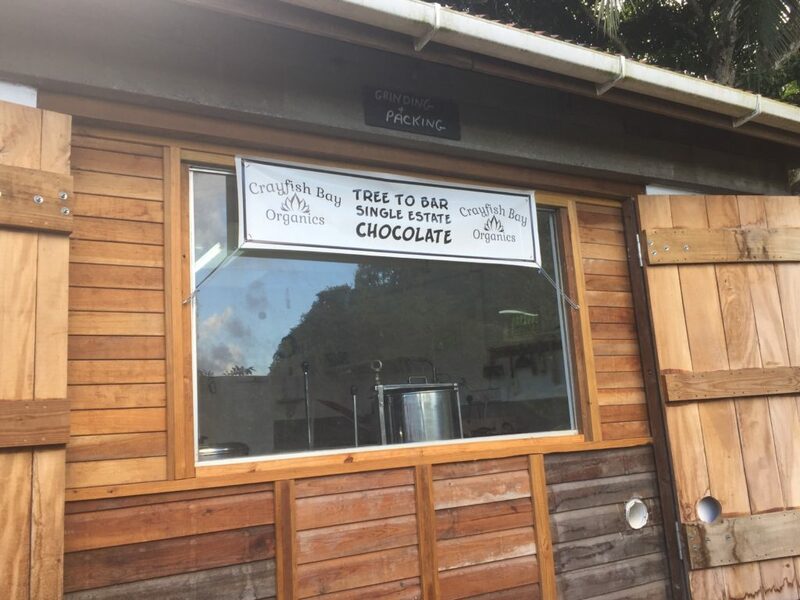 We met Kim and Lylette Russell – owners of the estate and Crayfish Bay Chocolate. Kim, a very entertaining, determined, and hard working man of English descent, lived most of his life on the water in the Caribbean and most recently settled down in Grenada. Lylette was originally from Guyana, South America and lived a good part of her life in St. Lucia. Kim and Lylette connected online and now live and work their estate at Crayfish Bay. Their acreage is lush and very rich in vegetation, mainly cacao. Everything is grown organically and certified organic. Kim is a true believer in giving back and integrating in his community. He has local farmers who farm and work his land. He owns the land but pays a very good rate for his cacao to be farmed and harvested. In addition to the payment, the farmers are allowed to utilize the land to grow other produce to sell and to feed the family. Their land produces cacao, bananas, plantains, oranges, nutmeg, cinnamon, allspice, guava, mango, passion fruit, grapefruit, avocado, star fruit, and so much more. If you needed a quick snack, all you had to do was pick a guava fruit or passion fruit right from the tree or stick it in a blender and make a smoothie. Kim and Lylette have their own house and two guest houses on the property, one of which we stayed in. The Caribbean cottage we stayed in is available for rent through Airbnb. 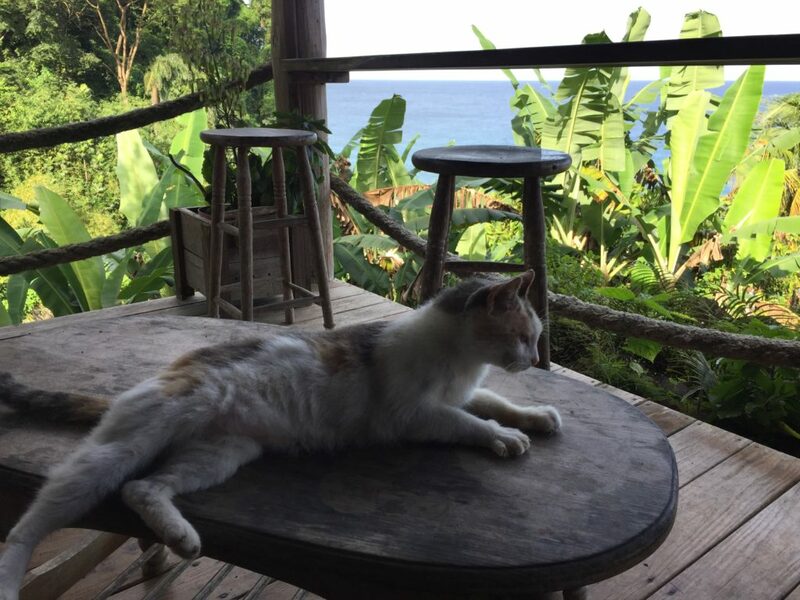 The cottage is rustic – it is not a luxury vacation villa, but more of an open-air, camping-style experience that overlooks the Caribbean Sea, allows for extraordinary views and has a hiking paradise right in the backyard. For a little extra money, they will prepare breakfast and dinner for you in their home during your stay – everything is prepared from the delicious agriculture at the farm and from the Caribbean Sea – there is nothing better than that!! Andrew and I took Kim and Lylette up on that option and savored every delicious meal! We explore those delicious meals in a separate blog post. 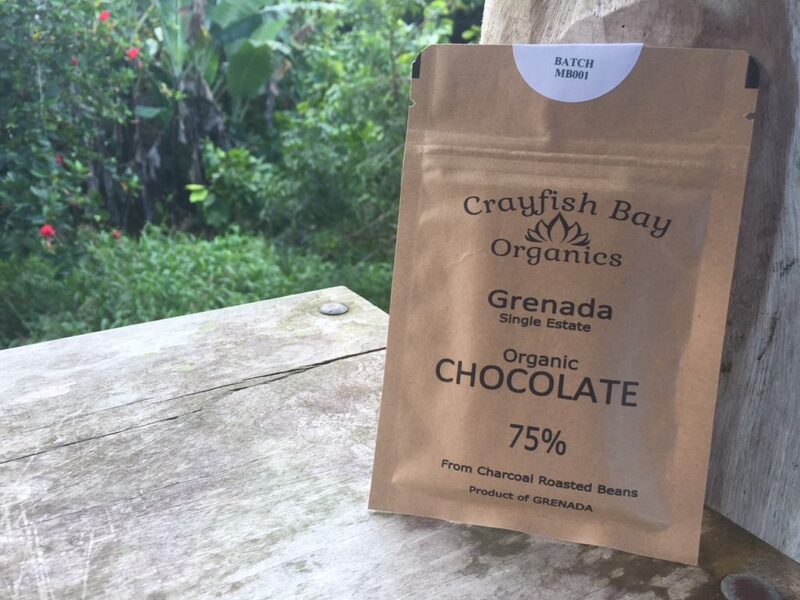 (click here to read more about eating organic, local and healthy in Grenada). Kim and Lylette initially sold their cacao beans to other chocolate makers and through the local cooperative, but 18 months ago they began to make their own chocolate. They make one 75% bar with 2 ingredients – organic cacao from their farm and organic cane sugar. The entire ‘tree to bar’ process occurs right at their estate – and it is an amazing process to experience. Every cacao farmer and chocolate maker is unique. Kim and Lylette have a unique roasting technique – they charcoal roast their cacao beans. In addition, Kim is a a gentleman who knows how to tinker, fix, revise and repurpose equipment and machinery. Most of their chocolate making equipment and machinery has not been purchased new. 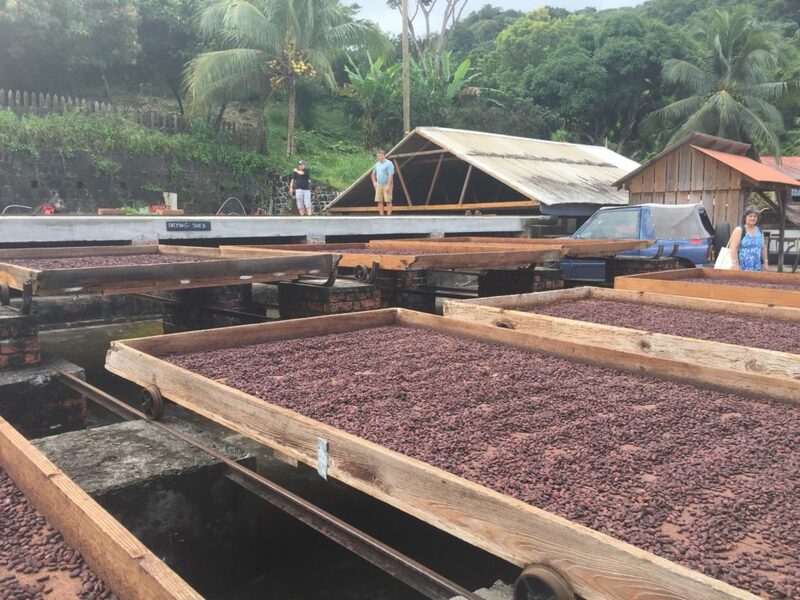 Kim has figured out economical ways to rebuild and repurpose the machinery used to transform the cacao pod into a chocolate bar. Lylette has been the primary maker of their delicious chocolate bars. She transforms the charcoal roasted cacao beans into delectable bars. 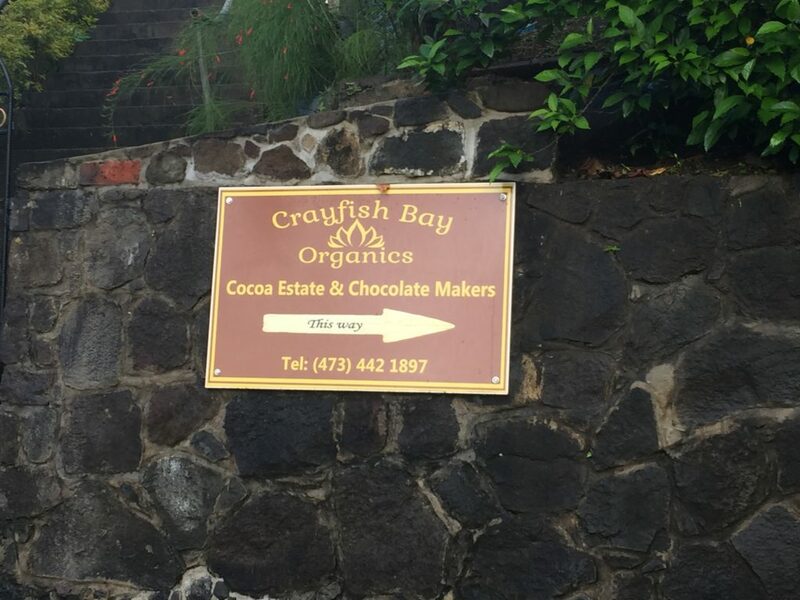 I have personally tasted hundreds of chocolate bars from a diversity of origins and chocolate makers from around the globe…and truly feel that the Crayfish Bay Chocolate Bar is one of the very best that I have tasted! Kudos to Kim and Lylette for creating an organic chocolate making process from start to finish and living what they preach. Thank you for an amazing agriculture adventure!